Phuket: The island̕s new beach regulations are now being enforced, and all beaches are to be regulated under the same standards. The beach regulations are to be monitored and controlled by the relevant government agencies, who will alo be monitored. The announcement came from Phuket Governor, Nisit Jansomwong, at a further meeting he chaired yesterday (January 29) about beach management. Governor Nisit said, “The problem now with beach management is that the local authorities of each area do not proceed by the same standard from many reasons. “I have consulted with the legal sector and they have confirmed that the provincial authorities are authorised to manage these public spaces, so I want everyone to work with confidence as best as they can. “From now on, the local authorities, both municipalities and OrBorTor (Tambon Administration Organisations) are the keystone for regulation control, and they will have to put marks to specify the border of the 10 per cent zoning area (such as ropes). “They must also put signs in Thai, English, Chinese and Russian on the beach fronts, and provide a team made up of municipality police, deputies to the district chiefs, police officers and representatives from the beach business operators. “The local authorities must upgrade the regulations to be a municipal law, and the regulations must be printed and spread to all business operators to make them understand. “I recommend that beach operators wear a shirt or some kind of identification to show that they are legally registered,” he said. He went further by adding, “We need to announce the regulations wider to get the tourist̕s attention. In addition, there will be a new Beach Management Department in every municipality to work on the monitoring and controlling of each zone and the regulations. “From now on, the local authority team monitoring the beach will have to do field operations everyday to make sure that the measures are strictly followed as there are still some people trying to break the rules,” concluded the governor. Meanwhile, Vice Governor, Suthee Thongyam, responsible for taking care of Kathu District reported the outstanding problems relating to his area. 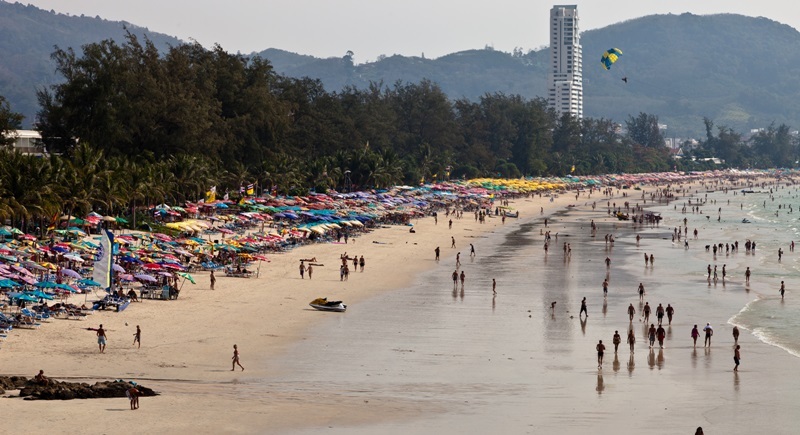 “For Patong beach, there are still some business operators who are trying to break the rules. “The beach is long and there were only three special zones. There were some non-registered operators selling umbrellas outside the zone and between the gaps of the zones, so, we have decided to make five zoning areas to reduce the gap making monitoring easier. “Also, there are some jet ski operators bringing tables and umbrellas on the beach, outside the zone, to offer jet ski services,” he said. With regards to Kamala, V/Gov Suthee said the area has similar problems to Patong but there are also conflicts between business operators. Therefore, he has ordered the zoning in Kamala be postponed, and for the time being no umbrellas, masseurs or beverage vendors are allowed on Kamala beach. As for the monitoring of his area, he said that there will be a team of provincial volunteers surveying the sites and taking pictures so they can report to him everyday at 10am. Governor Nisit had previously made mention of a contest for the best and worst beaches of each district, and he stated in the meeting that it is hoped that this will take place at the beginning of the next high season. what about jetski that 75 % of people does not want to see and to hear on beaches ?In Patong beach "some operators are trying to break the rules" so instead to arrest them , we give them more space I do not this is the way to do as the next step will be more and more space allowed. The Governor is clearly going all out to improve Phuket Beaches? The idea of discussing with the Hotels to spread the word could be helpful, however, as an Expat I do not stay in Hotels & there are many smaller Guests Houses & Resorts which may be missed? Is it something which the News could assist in spreading? Once there is a clear & concise announcement from the Governors Office?